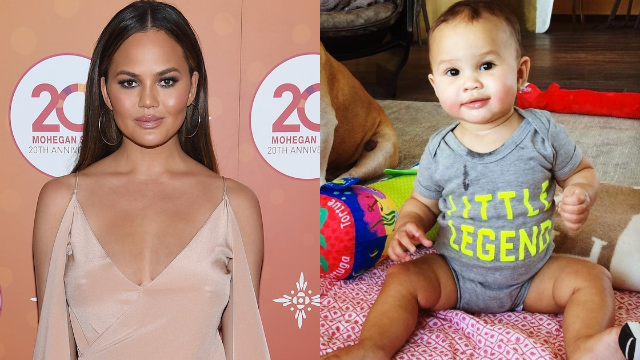 Chrissy Teigen had a hilarious reaction to a website mistaking Luna for a different baby. Chrissy Teigen has become pretty well-known for her sense of humor, especially on social media, so it's no surprise that she had a pretty perfect response to a website mistakenly using a photo of her daughter Luna in an article about a totally different baby. On Thursday, a fan sent Teigen a screenshot of an online article about Remington Monroe, the daughter of Teen Mom 2 star Corey Simms and wife Miranda Simms. The article was talking about Remi, but the baby in the photo looked an awful lot like Luna Legend. "Is this a picture of Luna they used as another baby's picture?" @Miriam_K93 tweeted to Teigen. The answer to that question was a resounding, "Yup!" In fact, here's a photo from that very same day on Teigen's Instagram page. Teigen's response was pretty hilarious. Teigen retweeted @Miriam_K93's tweet and wrote, simply, "This... this is my baby." Teigen wasn't the only one who thought the mix-up was funny. Her followers started responding with jokes (and GIFs, so many GIFs) of their own. LOL. Let this serve as a reminder to us all to always double-check that the photo you have of a famous baby is of the correct famous baby.